René Jules Lalique was born in Ay, Marne, France on April 6, 1860, and died May 5, 1945. He was a glass designer, renowned for his stunning creations of perfume bottles, vases, jewellery, chandeliers, clocks, and, in the latter part of his life, automobile hood ornaments. The firm he founded is still active. At age 16, he apprenticed with the Parisian jeweller, Louis Aucoc. Then from 1878-1880 he attended Sydenham Art College in London, England. After returning to France, he worked for Aucoc, Cartier, Boucheron and others. In 1882 he became a freelance designer for several top jewellery houses in Paris and four years later established his own jewellery workshop. By 1890, Lalique was recognized as one of France’s foremost Art Nouveau jewellery designers; creating innovative pieces for Samuel Bing’s new Paris shop, La Maison de l’Art Nouveau. He went on to be one of the most famous in his field, his name synonymous with creativity and quality. Recognised as one of the world’s greatest glass makers and jewellery designers of the art Nouveau and art Deco periods, René Jules Lalique was an imaginative and creative artist in all his work. Lalique’s early life was spent in many different types of artistic businesses, acting as apprentice and assistant. This heavily influenced the designs he used in his later life, including his emphasis on glass. He used the most modern and innovative manufacturing techniques and equipment available, allowing more than one glass piece to be made at a time while still looking hand made, which meant his quality jewellery was available to the general public. René Jules Lalique’s early life was spent learning the methods of design and art he would use in his later life. At the age of two his family moved to a suburb of Paris due to his father’s work, but travelled to Ay for summer holidays. 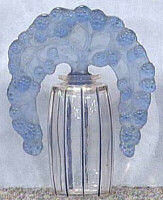 These trips to Ay influenced Lalique’s later naturalistic glasswork. When he was twelve, he entered the Collège Turgot where he started drawing and sketching. With the death of his father two years later, Lalique began working as an apprentice to the goldsmith Louis Aucoq in Paris, and attending evening classes at the Ecole des Arts Décoratifs. He worked here for two years and then moved to London to attend the Sydenham Art College for two years. At the Sydenham Art College, his skills for graphic design were improved, and his naturalistic approach to art was further developed. When he returned from England, he worked as a freelance artist, designing pieces of jewellery for French jewellers. Following this, he opened a business in 1885, and designed and made his own jewellery and other glass pieces for the rest of his life. 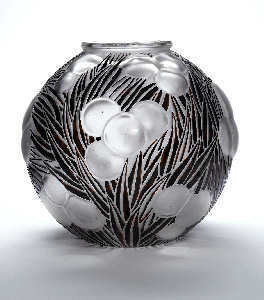 Many things influenced Lalique’s work, including the natural environment, and the art Nouveau and art Deco periods. The summer holidays Lalique spent at Ay, in France, and the time he spent at the Sydenham College of Art in London, heavily influenced Lalique’s naturalistic work. As a result, many of his jewellery pieces and vases showcase plants, flowers and flowing lines.